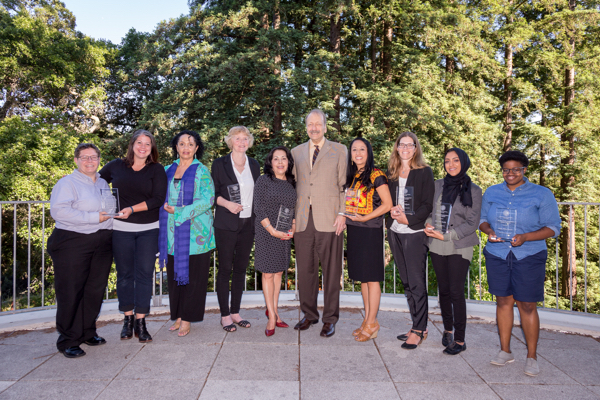 In an effort to showcase work that promotes diversity and inclusion, UC Santa Cruz presented students, faculty, staff, and programs with the 2017 Chancellor’s Achievement Awards for Diversity. Blumenthal presented seven Chancellor’s Achievement Awards for Diversity, as well as the Women in Science and Engineering (WiSE) Award, during a May 31 ceremony at the Colleges Nine and Ten Multipurpose Room. Anthropology Professor Olga Najera-Ramirez was presented with the lifetime achievement award, which recognizes her extraordinary contributions to diversity and inclusion. Najera-Ramirez’s research centers on documenting and critically examining expressive culture among Mexicans in both Mexico and the United States. The scholarship addresses questions about identity formation, relationships of power, and expressive cultural forms. In addition to research, she advises the student run Grupo Folklórico Los Mejicas. This group, which was honored with a diversity award in 2013, is currently celebrating its 45th year at UC Santa Cruz. Stacy Philpott, a professor in the Environmental Studies Department, received an award for her work in community building, creative mentoring, program development, as well as inclusive academic and research efforts focused on students and staff from underserved and underrepresented backgrounds. Philpott directs the Program in Community and Agroecology, which focuses on hands-on sustainable-living skills, food systems and food justice issues. She is also a supporter of the youth-at-risk program Food What, and is a vocal backer of community gardens, one of her research areas. Yulianna Araceli Ortega Ramirez, director of the STEM Diversity Programs, was honored for being a dedicated and transformative educator. She has been instrumental in designing and implementing a number of technology initiatives focused at advancing community college students from diverse backgrounds into STEM careers and in particular to increase the representation of Latino/a students in the sciences. Over her 12 years of service, she has mentored more than 1,000 undergraduate and graduate students. As a first-generation college student and Latina in STEM, she understands the daily struggles, family pressures, and mental stress that minority students face every day. Donnae Smith, coordinator of diversity and inclusion programs in Colleges, Housing and Educational Services, developed an internship program that provides undocumented students with an opportunity to work in campus residential communities, promoting greater understanding and awareness of diversity and inclusion. Additionally, she develops curriculum for, and delivers training to, the more than 200 residential advisors, neighborhood advisors, and community advisors across campus, making sure they are comfortable with diversity and inclusion issues. She also teaches courses for the Diversity and Inclusion Certificate Program, and has spearheaded the creation of the We Are Slugs! Diversity Orientation to be launched during the 2019–2020 academic year. Maya Alicia Iverson, a fifth-year graduate student in the Sociology Department, studies race, television, and archives. She has been a member of the Black Experience Team since 2014, and currently serves as co-chair. She has managed outreach efforts through social media platforms and communications to UCSC’s African, black, and Caribbean student organizations, among others. She also has been instrumental in maintaining growing relationships with alumni. She worked with founding member of the Black Alumni Association, Shonelle Blake, to organize the Alumni Weekend program “In Celebration of Black Life at UCSC,” which featured alumni testimonies and memorabilia that were used to create a “memory space” that spoke to the various ways UCSC’s black community has and continues to affirm its place and presence on campus. Abir Zehra Rashid, a College Nine student majoring in business, was recognized for the passion and dedication she brings to the Muslim Student Association. As a board member of the MSA, Rashid has developed close relationships with many campus organizations. She was also the lead facilitator and organizer for one of the MSA’s biggest events, the MSA West Conference. She took 30 UC Santa Cruz students to a conference at UC Riverside, where nationally renowned scholars, activists, and athletes spoke about what it means to be Muslim today. Rashid brought that knowledge back to campus, where she worked with students groups on being allies, and on educating the campus about Islamophobia and the impacts of executive orders banning Muslims. The Nekses Social Justice Retreat was honored for its work in creating social change makers. The program was developed in the summer of 2015 to help students understand more about their intersecting identities, the identities of others, and how perceptions of identities are influenced. The curriculum is presented by a small group of campus partners who hold a variety of positions across campus. These facilitators, identified each year, volunteer their time and help develop the content from one year to the next. 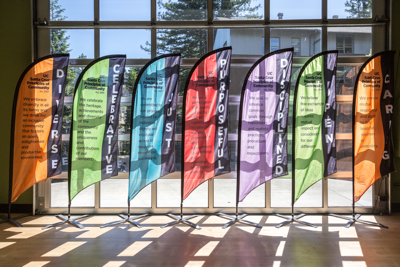 The goal of the retreat is to raise the consciousness of UCSC students, while providing them with the necessary tools to apply what they learn to their academic, work, and personal lives. The award was accepted by Julie Oberts, associate college administrative officer at Stevenson and Cowell colleges; Donnae Smith, coordinator of diversity and inclusion programs in CHES; Kathy Cooney, associate college administrative officer at Porter and Kresge colleges; and Janet Nava, coordinator for residential education at Kresge. Blumenthal presented the Women in Science and Engineering Award—the “WiSE” award—to Ólöf Einarsdóttir, a professor with the Department of Chemistry and Biochemistry. Einarsdóttir has promoted women in STEM in a wide range of ways throughout her career. She has mentored female graduate students in her laboratory, encouraging and supporting them to the next stages of their careers in both academia and industry. She has been a role model for female graduate and undergraduate students, fostering their scientific abilities, critical thinking, and communication skills. As a department chair and a member of faculty search committees, she worked to recruit outstanding women into chemistry and biochemistry. Einarsdóttir was also the first woman to achieve tenure in UC Santa Cruz’s Department of Chemistry and Biochemistry, the first to be promoted to full professor, and the first to chair the department.